My almost-two-year-old daughter doesn’t seem to like meat. I’m not sure if it’s the taste or the texture – either way, I am determined to get good sources of iron and protein into her. Lentils are a great source of iron. They actually contain more iron than red meat (gram for gram) – although the type of iron in red meat is better absorbed (higher ‘bioavailability’). Luckily for me, my husband and I, plus our other two children also love beans and lentils. Today’s vegetarian shepherds pie blog was an experimental recipe – and definitely one I will make again. It was very popular with the kids and their 14 month old cousin who stayed for tea! I bought all the ingredients this meal for £3.20 – that’s only 64p per adult serving. Lentils are so much cheaper than meat, and nutritious too! 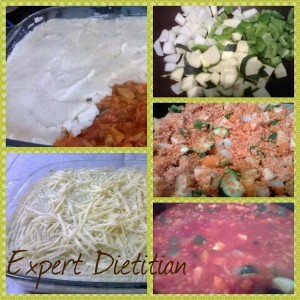 The post Vegetarian Shepherds Pie appeared first on Expert Dietitian.